COX'S BAZAR, Bangladesh, Dec 16 2017 (IPS) - Ferdous Begum was cleaning her child after he had defecated in the open, using leaves she collected from a nearby tree at Bangladesh’s Teknaf Nature Park. The settlement is packed with Rohingya refugees who fled military persecution in Myanmar since August. Other camps near Teknaf are also facing acute shortages of water, especially access to drinking and clean water, while aid workers face difficulties with hygiene management for the refugees crammed in squalid camps stretching from Teknaf to Ukhia in Cox’s Bazar. The latest UN report shows an estimated 655,000 Rohingya have crossed into Bangladesh after fleeing violence in Myanmar’s Rakhine State, increasing the total Rohingya population in Cox’s Bazar to 867,000 since Aug. 25. The report said new arrivals were living in spontaneous settlements with increasing demand for humanitarian assistance, including shelter, food, clean water, and sanitation. Ferdous Begum said her son was unwell last night, with a stomach upset. “Misfortune follows us anywhere we go,” Begum said. Aid workers said refugees, especially pregnant women, lactating mothers and children were exposed to the risk of health hazards because of water shortages that led to poor hygiene management. Diphtheria is rapidly spreading among Rohingya refugees in Cox’s Bazar, the World Health Organization (WHO) warned last week. In one month, as of Dec. 12, a total of 804 suspected diphtheria cases, including 15 deaths, were reported among the displaced Rohingya population in Cox’s Bazar. The first suspected case was reported on Nov. 10 by a clinic of Médecins Sans Frontières (MSF) in Cox’s Bazar, according to the WHO. A number of aid workers working in the field said hygiene was very important to prevent disease outbreaks in these overcrowded camps. Many of the latrines made initially were already overflowing and faecal sludge was seen in the open in almost every camp. And many of the tubewells or hand-pumps are broken, shortening the supply of safe water. Dr. Sharma said a large number of his patients were women and children suffering from acute malnutrition and anaemia, as most of the pregnant and lactating women were very young – many still in their teens. “Hygiene is very crucial for them, but it seems they are not aware,” he said. A Rohingya refugee named Gul Nahar rushed to a BRAC aid centre with her six-month-old boy, Mohammad Haras, seeking help. “He’s been suffering from high fever along with diarrhoea for the last 10 days,” Nahar said. Nahar said the seven members of her family were living together in a single shanty room. WaterAid Bangladesh country director Dr. Md Khairul Islam told IPS he was aware of water shortages in the camps in Teknaf. “The situation might be exacerbated when local farmers start irrigation for their crops in the area soon,” he added. Executive director of the government’s Institute of Water Modelling, Professor M Monowar Hossain, told IPS there were plans to initiate a survey to ascertain the level of ground water there. “It’s a part of the national survey… It’s not particularly for the Rohingya issue. [But] Until we do the survey, we can’t say there is any scarcity of water,” said Prof Hossain, a former dean of Bangladesh University of Engineering and Technology (BUET). Local people fear the presence of over half a million Rohingyas will put additional pressure on water sources and that would worsen the situation in the coming months. They warned about a severe water crisis in the later part of winter, when the groundwater level naturally goes down. Rohingyas in the Jadimora area said that they were trying to collect water from tubewells in local communities, but on many occasions they’d been barred. In the absence of safe water, Rohingyas in makeshift camps in Damdamia Nature Park, Jadimora, Alikhali, and Unchiprang areas of Teknaf are collecting water from ponds, waterfalls and other untreated sources. “Nobody is supplying drinking water for us. We collect water from a nearby pond,” said a Rohingya community leader in the Damdamia area, Rashid Ullah. Many Rohingyas built makeshift shelters in forest preserves, felling trees and setting up shanties on hilly slopes. Other have taken refuge at overcrowded registered and unregistered camps. The haphazard sprouting of camps makes it hard to supply safe drinking water to Rohingyas, aid workers said. Department of Public Health Engineering officials said for the Rohingyas who took shelter in wild forests and hills, safe drinking water facilities like tube wells are nonexistent. “We can’t say we have reached all Rohingyas with safe drinking water and other facilities as they are living scattered,” Refugee Relief and Repatriation commissioner Mohammad Abul Kalam of Cox’s Bazar told IPS. “Particularly in Teknaf, we wanted to relocate those Rohingyas facing shortage of water to other camps, but they were not interested,” Kalam said. Aid workers say the Rohingya influx has slowed down, but several hundred refugees still arrive every day, adding pressure on both the government and humanitarian relief groups. The International Organization for Migration (IOM) has constructed more than 3,800 latrines and 159 wells in six host community locations – Whykong, Palonkhali, Jaliapalong, Kutupalong, Rajapalong and Baharchora. 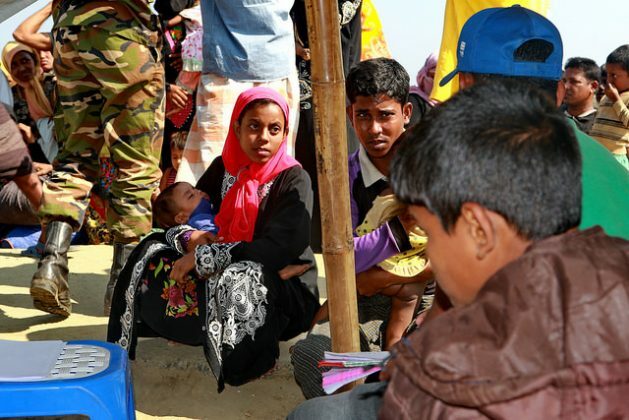 “Access to clean water and safe sanitation services is a problem for the communities hosting refugees in Cox’s Bazar,” said Alessandro Petrone, WASH Programme Manager for IOM’s Rohingya Response, in a statement earlier this month. “A global and up to date WASH assessment providing a proper gaps analysis and an activities plan is urgently needed. IOM is developing a rated assessment tool and will deploy teams to the field in the coming days to support this work,” said Petrone. 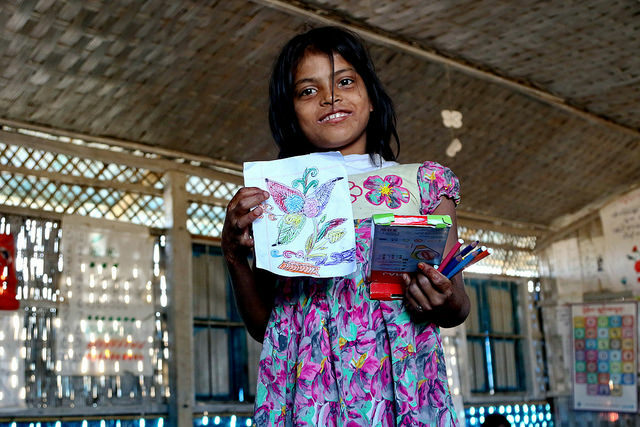 The Inter-Sector Coordination Group (ISCG), of which IOM is a part, reported this week that the humanitarian situation for Rohingya refugees in Bangladesh remained dire. The inter-agency Humanitarian Response Plan (HRP) for 2017-18 identified the areas of WASH, health, nutrition and food security and shelter for immediate scale-up to save lives in both settlements and host communities, it said. As per the HRP, the Rohingya population in Cox’s Bazar is highly vulnerable, many having experienced severe trauma, and are now living in extremely difficult conditions. The limited WASH facilities in the refugee established settlements, put in place by WASH sector partners, including UNICEF, prior to the current influx, are over-stretched, with an average of 100 people per latrine, the report said. New arrivals also have limited access to bathing facilities, especially women, and urgently require WASH supplies including soap and buckets. Given the current population density and poor sanitation and hygiene conditions, any outbreak of cholera or Acute Watery Diarrhoea (AWD), which are endemic in Bangladesh, could kill thousands of people residing in temporary settlements, the report warned.